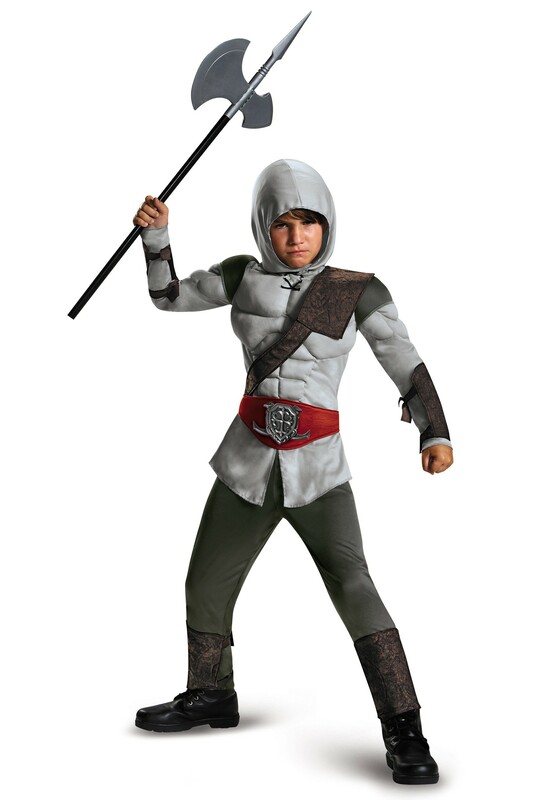 … When your kid says that the only profession that is on the horizon is that of the assassin, you have to wonder, one, what sort of dark university or ancient brotherhood is around that helps to ensure a young person can develop safe assassination techniques and, two, what the heck happened!? Don’t fear. Assassins have been an attractive field for youth for a very long time. It’s only natural that a tyke with exceptional dexterity and an interest in free running and wall jumping would seek to put those natural talents towards long term employment. We have the gear needed to help your tyke along the way to this profound career in the Assassin Muscle costume. This simple jumpsuit has padding built into the shoulders, chest, and torso to show off the muscles that may yet be fully developing. A foam belt shines gossamer red against the gray-white of the tunic and has a Velcro spot for the plastic belt buckle that shows the coat of arms of the profound guild of assassins. Arm and leg guards function as armor against would-be attackers, though you may seek to acquire an additional accessory in the weapon of choice. We hear there is a brotherhood that has put together some excellent hidden blades!